The day is finally here, the start of our adventure around Europe! To say that we were organised is a bit of an understatement, with lists upon lists we had everything packed and in the right spot. I'm honestly suprised at how little we haven taken with us, seeing as we won't have a base for almost a month, plus all of the mobility equipment I need. I decided to take a few extras at the last minute; a compact saline nebuliser just incase I fall ill or feel rundown, I can't let the team down and not be able to drive! 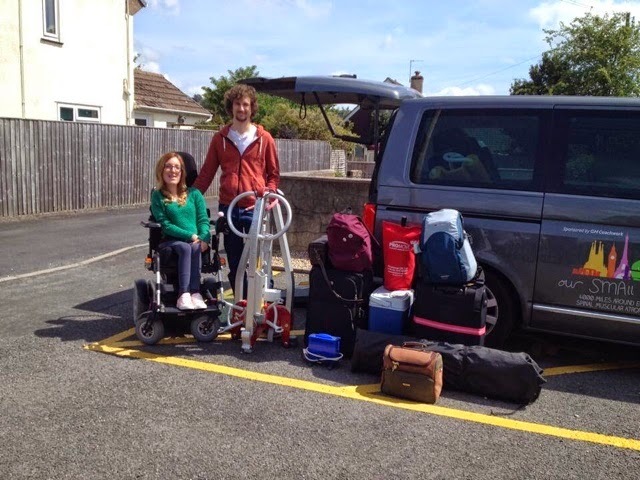 We also packed a spare wheelchair charger and borrowed a plug in cool box from my parents for the longer drives. After checking the car tyres and loading up, we said our farewells and were off to Plymouth ferry port to catch the ferry to Santander, Spain. Checking in was so simple as ever; arriving an hour and a half early and having the disabled sticker stuck on the windscreen, the crew were quick in assigning us to our designated lane, and instructed to sit with our hazard lights on. After an hour waiting which flew by with a good picnic to keep us occupied, we boarded the ferry as one of the last vehicles, giving me plenty of room to use the tailgate ramp and plenty of time to leave the vehicle safely with all of the necessary equipment. Our cabin is a family sized disabled cabin, situated by the elevators and on the deck beneath the canteens and restaurants. 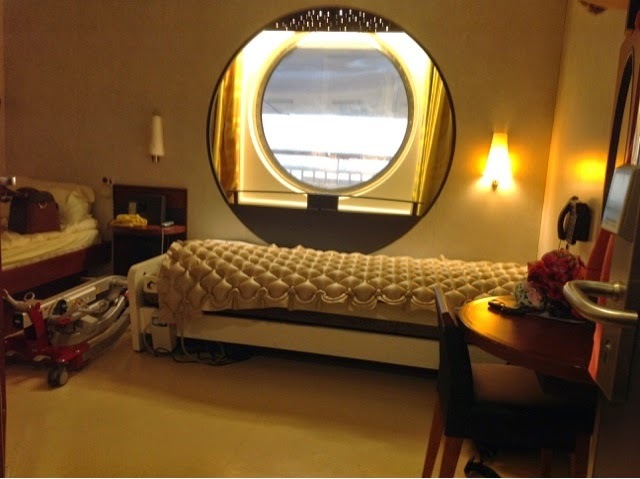 Great location and wide doorways, but the room is incredibly small for a disabled cabin. There isn't a lot of room for hoist transfers but with a carefully angled wheelchair and proactive PA, it will be possible. A bonus point is that both of the beds (the sneaky third and fourth beds pulls down from the ceiling!) have access for the hoist legs to slide underneath, which I didn't expect at all. Again, the bathroom is pokey but its only for one night so I can manage, the wet room is useable but the hoist will struggle to get over the very large lip in the threshold which keeps the wet room watertight. The rest of the room has all accessible features such as lowered light switches and grab rails, so in general it's good access, just the space of the room is really small. The boat itself is perfect for disabled visitors, we are on the Pont Aven and where older boats have the doorway seals to make it watertight between areas, the entire boat is level access. There are ample lifts on the boat so even when lazy people take them instead of using the staircase, you don't have to wait long until one arrives. However, I noticed that one of the lift opens directly opposite the staircase so be very careful when reversing out backwards! 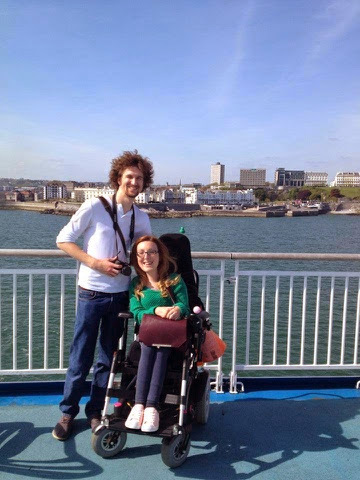 Each member of staff has been helpful and smiling throughout the boat, and the corridors are really wide so there's plenty of room for wheelchairs. I've seen about 4 electric wheelchairs on board today! 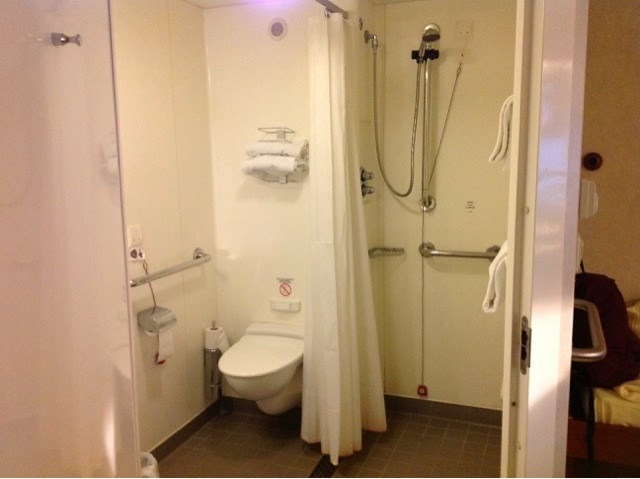 There are numerous disabled toilets on each deck and they are all bigger than the one in our cabin, without the watertight threshold. Have to say the rocking of the boat is putting me off exploring just at the moment but I think I'm tired now that the stress of packing is over. Let's hope for a nice calm crossing and a good night sleep. Thanks for your support, we are both so pleased that you're following our progress, and encourage you to keep sharing our page on Facebook!